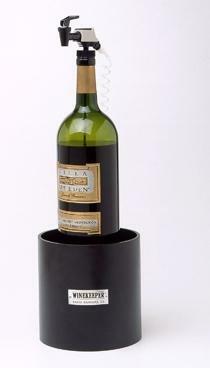 Wine dispensers like the Winekeeper Noir make great gifts. Wine dispensing taps provide a way for wine drinkers to preserve and dispense their favorite wines. There are several systems available for home use at a wide variety of prices. Some wine drinkers find that it is easier for them to control the flow of wine as they pour if they use a tap mechanism that can turn on and off the flow of the wine from the bottle. Restaurants and bars have been using these types of dispensing taps for many years because they provide an easy, dripless way to serve wine. Now these dispensing tap systems are also available for the home wine drinker. Dispensing tap systems come in a wide variety of styles and price points. Some are very utilitarian in design with others designed for display in the kitchen or home bar area. You can purchase a tap system for a single bottle of wine, several bottles of wine or as a way to serve wine in large volumes. Most dispensing tap systems include a method to minimize any oxygen getting into the wine causing the wine to change taste and appearance. Some systems even provide temperature control for your wine. The style you choose really depends on your wine serving needs and the price you want to pay. The bag-in-box concept is one of the least expensive options on the market for a dispensing tap. Most of these "bag" concepts involve pouring the wine into a bag which is then stored in a container in the refrigerator. The full configuration has a tight seal that protects the wine against any contact with oxygen much the same way that box packaging protects wine that is sold in a box. Each manufacturer of this type of bag-in-box dispensing tap uses a slightly different design. Some hold a few bottles of wine or some, like the Fermtech Wine on Tap can keep up to nine bottles of wine fresh for up to six months. These are relatively inexpensive systems usually running around $20 to $25. For those who want to dispense larger quantities of wine, a dispensing barrel might be just what they are looking for as a way to serve wine at a party. Manufacturers usually make the casks from oak and typically hold up to twenty gallons. They also line the cask with a plastic liner; however, there is no protection against oxygen contact. The cost of a dispensing cask generally starts at about $250 and increases based on the volume and construction of the cask. Nitrogen replacement systems provide a way to protect the wine against contact with oxygen. As the volume of wine decreases in the bottle, 100 percent nitrogen replaces the oxygen. Nitrogen does not have any odor or taste so it does not negatively affect the wine. The color and taste of the wine remains true as the volume of wine in the bottle decreases. With a nitrogen replacement system, you can expect wines to last anywhere from one to three weeks, depending on the age, type and temperature of the wine. There are several nitrogen replacement systems on the market. One of the best known brands is from Winekeeper, a company with a long history of making these nitrogen replacement systems for bars and restaurants. Winekeeper offers both single and multi-bottle systems through many online and in-store wine retailers. The Keeper system is designed to preserve one bottle at a time. The bottle receives a stopper dispensing cap which is attached with tubing to a nitrogen cylinder. After serving, you can remove the cylinder and connecting tubing in order to store the wine bottle with the dispensing cap for future use. Each disposable nitrogen cylinder can preserve up to 25 bottles of wine. The full system usually costs about $150. If you are looking for a dispensing system that hides the nitrogen cylinder and tubing when serving or displaying your wines, the Noir system hides the nitrogen cylinder and tubing from view. An eight inch cylinder can hold smaller .75 liter bottles as well as large, six liter bottles. The sides of the cylinder are tall so you can place ice around the bottle of wine to keep it chilled. The single bottle style starts at around $300. There are also styles available which hold two and three bottles at a time. Some nitrogen replacement systems can also keep wines at the proper serving temperature. The Napa 4-Bottle Wine Dispenser Preservation Unit from Winekeeper. Though restaurants and bars frequently use this product, it is equally useful in a home setting. This system hides the nitrogen gas preservation system within a custom built wooden cabinet. The cabinet is not a wine refrigerator but it can be built to maintain the proper serving temperature of any combination of four white and red wines. This full system starts at about $1,500. Wine dispensing taps are very convenient for serving wine. If you find that you are not finishing the full bottle of wine, you may want to also consider looking at a wine dispensing tap system that also protects the integrity of your wine with a nitrogen replacement system. They can be expensive; however, the price you pay for the system can more than pay for itself in the value of the wine you can save and enjoy later.